Let us equip you for success! If you answer “yes” to any of the following, this is a great investment for you! Are you are interested in serving on the board of directors of a nonprofit organization that serves clients in Cobb County? Have you recently joined a board, but are not sure what your duties and responsibilities are? Then, this training is for YOU. Board service is dramatically different in today’s environment than perhaps any other time in history, with greater expectations placed on board member performance and engagement. 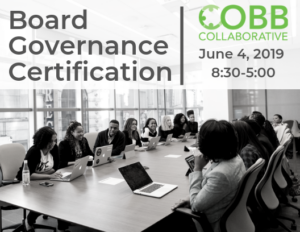 Come ready to learn the board’s roles and responsibilities and join a database of graduates certified to serve on boards of organizations either located in Cobb or serving clients in Cobb. Registration information available HERE! Take advantage of the early bird pricing of only $159 available through April 30. A small investment that will pay BIG dividends for your organization. Cobb Collaborative is a membership of nonprofit organizations, local government, businesses, faith-based organizations, educational institutions, professional organizations, associations and citizens who share ideas, expertise and resources to meet the needs of Cobb County. To convene community stakeholders to facilitate the sharing of ideas, expertise and resources to strengthen the non-profit community.